To get started all you need to do is fill the fresh box to the stated line, add a few drops of the lavender and chamomile oil and place your cheeky wipes in ready to go! You do the same with the mucky box but using the tea tree and lemon oil instead. There are even little hooks to attach the mesh bag to so your wipes can be removed to be washed without having to fiddle around with dirty wipes. 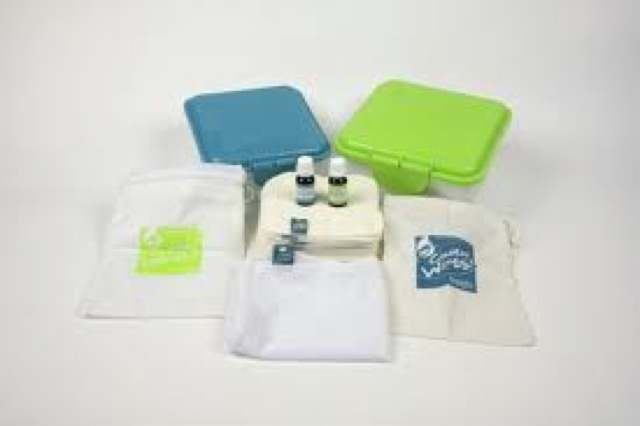 Included in the kit are 'fresh' and 'mucky' waterproof bags which are perfect to stick in your change bag all you need to do is squeeze the excess water from your wipes to store them in your fresh bag and place them into the mucky bag once used. We've been using our kit for 3 weeks now and I couldn't be happier with my choice of wipes! Neither of the kids have had any soreness at all since we've been using them. I've found I only need to use one wipe per change even for the dirtiest of nappies. I put them in the wash with my usual nappy load which means no extra washing, they are very quick drying and when all is dry even my nappies have a lovely smell to them thanks to the oils. The biggest plus is that the wipes are saving me a fortune! The full kit listed above costs just £39.99 which i would usually spend on disposables in less than 6 months. So £39.99 for wipes that can be used over and over is fantastic. I haven't yet found anything I dislike about Cheeky Wipes and I don't think I ever will. They've even got my partner thinking they are amazing which is very impressive. I would definitely recommend Cheeky Wipes to anyone looking to use reusable wipes. These sound fab! Am already intending to use cloth nappies for bump, but might just have to give these a go too! If you are planning to use cloth nappies then these are definitely a must! They do look good, if i could ever keep up with my washing I may consider. We love our cheeky wipes, have a hands and face set and a botty set, great for sticky faces and hands on toddlers too! And perfect for removing make up! So glad to hear you're a convert! I think i need to try the hand and face set! We love cheeky wipes too, i have a set for house work and a set for babies!